Last week, I finally got through the last of the apples that we picked back in October. Getting through 20 pounds of apples is no easy feat, let me tell ya. I managed to make sauce, a few pies, a crumble, and turnovers plus we ate tons of apples straight. 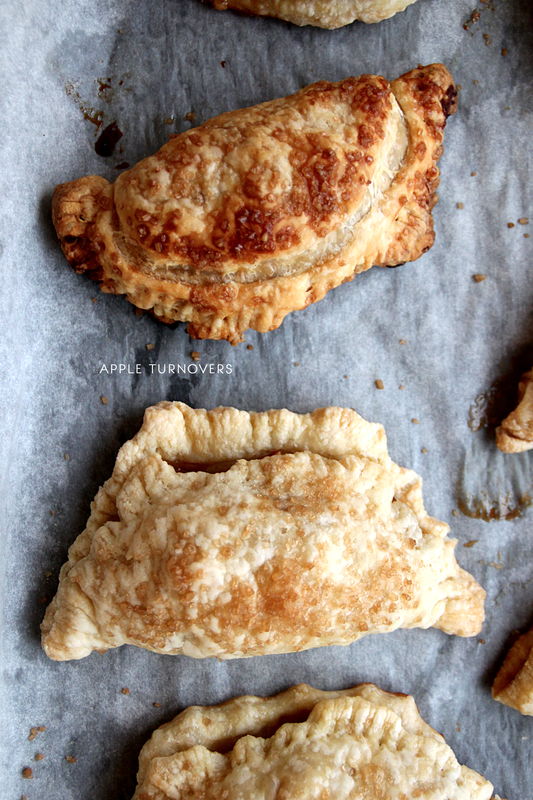 Apple turnovers remind me of my childhood, we’d eat them warm, straight out of the oven on Sunday’s before church. At that age, apple pie (or any fruity dessert) wasn’t something I liked at all. Only desserts that were vanilla and chocolate made the cut, but somehow, apple turnovers slipped through that cracks. I could never resist the buttery, flaky, goodness of puff pastry. I followed this Ina Garten recipe that uses store-bought pastry dough which makes these apple turnovers easy to make and super tasty. I accidentally bought the shells which worked out fine after rolling them flat. I also omitted the dried cherries because I didn’t have any on hand and used turbinado sugar for sprinkling. These guys were awesome! Enjoy! picking apples & then making those beautiful babies sounds too wonderful. good job! Thank you! They were delicious and SO easy!